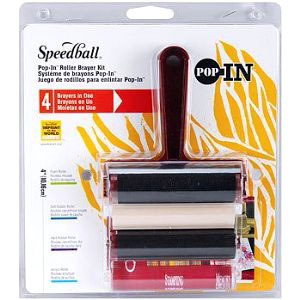 Roller Brayer 4-in-1 Kit Includes Sturdy Plastic Handle & 4 Different 4" Rollers. An Essential Tool In BLOCK PRINTING. Also valuable in Scrapbooking, Paper Crafts, Home Decor and much more. Handle Without Roller Measures 4.5" x 4.5" x 1.625". Rollers Vary in Diameter. Overall Length of Rollers is 4"
to Spread Substances Easily and Neatly.